Tinnitus and Hearing loss are the two most prevalent service-connected disabilities of veterans receiving compensation. Collectively, these conditions impact more than 1.5 million veterans. The Department of Defense Hearing Center of Excellence places this number at 1.9 million. The affects of hearing loss range from the obvious, to depression, anxiety, social isolation, increased risk of falling, and fatigue. Note: The 2012 Annual Benefits Report has been withdrawn temporarily to ensure accuracy and consistency with Education data reporting. It will be upload an amended copy once the data is validated. Conductive hearing loss: due to problems with the ear canal, ear drum, or middle ear and its tiny bones. "Annual Benefits Report Fiscal Year 2011." Annual Benefits Report Fiscal Year 2011. U.S. Department of Veterans Affairs, Veterans Benefits Administration, n.d. Web. 8 Sept. 2013. <U.S. Department of Veterans Affairs, Veterans Benefits Administration, Annual Benefits Report Fiscal Year 2011 http://www.vba.va.gov/REPORTS/abr/2011_abr.pdf>. "Infographic Explains Hearing Loss, Encourages Warriors to Protect Hearing ." Department of Defense Hearing Center of Excellence. Department of Defense, 2 May 2013. Web. 8 Sept. 2013. <http://hearing.health.mil/pressroom/featuredcontent/13-05-02/Infographic_Explains_Hearing_Loss_Encourages_Warriors_to_Protect_Hearing.aspx>. "Types, Causes and Treatment | Hearing Loss Association of America." Hearing Loss Association of America | The Nation's Voice for People with Hearing Loss . Hearing Loss Association of America | The Nation's Voice for People with Hearing Loss , n.d. Web. 8 Sept. 2013. <http://www.hearingloss.org/content/types-causes-and-treatment>. Hearing tests, known as “audiograms,” measure a person’s ability to hear sounds based on the frequency (pitch) and decibel level (loudness) of sounds. 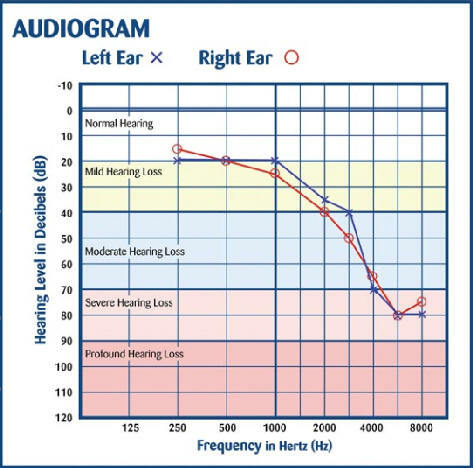 An individual's audiogram shows a visual picture of a person's hearing. Perfectly normal hearing would show a flat line across the top of the audiogram at 0 dB. 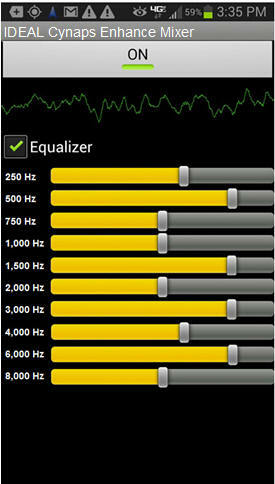 Since most people don't have perfectly normal hearing we take "Normal" as a range from 0 dB to 20 dB. When hearing falls within this range we classify the hearing as normal. On an pure tone audiogram the frequencies across the horizontal scale are tested from 125 hertz (Hz) on the left side to 8,000 Hz on the right side. This range was chosen so we can see the hearing acuity from just below the range of human speech to slightly over as speech is approximately 300 Hz to 6,000 Hz. Frequencies tested across this range are the octave's and half octave's. The vertical scale on the audiogram ranges from 0 dB at the top of the page to 110/120 dB (depending on the testing equipment used, at the bottom of the chart. Testing is done in 5 dB steps and our reference for decibels on the audiogram is in HTL (Hearing Threshold Level) which simply means we have flattened (averaged) the 0 level across the testing range. The lower down the person's Heating Threshold Level is the greater the degree of hearing loss at that frequency. The are in the middle upper area is what we call the speech banana or canoe. Within this area are found all of the phonic clues that give us the meaning to the spoken word. Phonic clues that fall above a person's Hearing Threshold Level at that frequency are not heard unless one of the following accrues; The speaker raises their voice, one or both parties move closer together, the speech is amplified, or we find a way to eliminate the distance between the speaker and the listener. Phonic clues that fall below the person's Hearing Threshold Level are heard by the individual but if they are only greater by 5 to 12 dB then these sounds can be covered up by lower frequency sounds and background noise fairly easily. The greater the surrounding background noise, often other speech in the area, the less clarity a person will have. This is what drives spouses, family members and friends crazy is one moment the person with a hearing loss is understanding fine and two minutes later they are struggling to understand or are misunderstandings some or all of what is being said. What has happened is something has changed in the listening environment, the ambient noise level referred to as the noise floor. Maybe the dishwasher or the furnace fan has come on, the clothes dryer went into spin cycle, the conversation moved into the living room with the TV playing, or some other acoustical event is taking place. For a person with normal hearing this type of acoustical event is hardly noticeable as even the softest sounds are still 15 20 louder than the person's hearing threshold level but for a person with a hearing loss suddenly they those sounds that were only 5 10 dB louder than their hearing threshold level are now at or below the incoming noise event. For a person with a hearing loss they must have, at a minimum, the incoming speech they are interested in 15 to 20 dB louder than any competing sounds or they loose speech clarity. The louder the competing sounds the less clarity they have. Visualize attempting to carry on a conversation at a Trailblazer or Timbers game at a distance of five to six feet. A normal hearing person has trouble in type of acoustical listening environment. They generally have to get within 30" to carry on a conversation and even then it can be difficult.